If you are looking for the best small flashlight on the market you have come to the right place. When it comes to picking out the best small flashlight you are going to want to keep a few things in mind. If you truly want to find the best small flashlight on the market you are going to need to pay attention to the finer details of the flashlight to ensure you opt for one that has all of the features that you need. CR123A Battery: No products found. The first thing you need to be aware of is what we mean by a small flashlight. To us a small flashlight is going to be a light that measures anywhere from 3 to 4 inches in length, basically a small pocket flashlight. 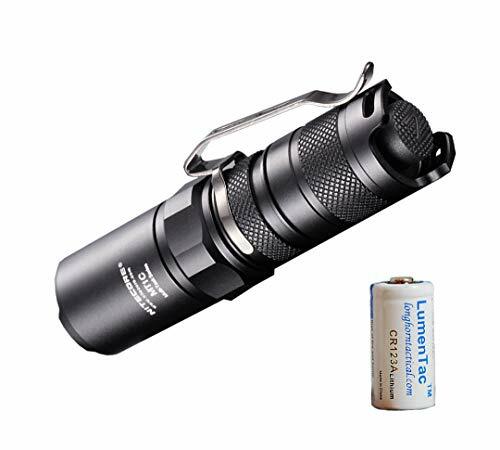 Now when you are looking at the individual flashlights you are going to need to consider the type of batteries that they use, some will require a CR123A, while others will use AA or even an 18650. When picking a battery type keep in mind that while AA are easy to come by, they don’t have the same amount of power and shelf life as other battery types. Now many people think that the smaller the flashlight, the less powerful it will be. However, that is far from the truth. When looking at the best small flashlights you will notice that some small lights are more powerful than others. Don’t let a flashlight’s size fool you; small ones can be just as bright, if not brighter than a full sized flashlight. The Fenix E12 is the new and improved version of the best selling Fenix E11. The E12 is one of the smallest flashlights on the market that you can take anywhere and use as a fully functioning flashlight. 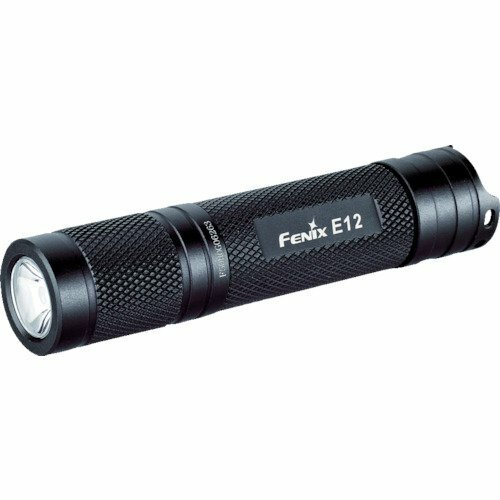 Using a single AA battery the Fenix E12 can put out a beam that reaches 289 feet. The state of the art CREE XP-E2 LED bulb has a lifespan of 50,000 hours and puts out an even, soft beam that works great for close up illumination, as well as distance. One of the toughest things about LED flashlights is maintaining brightness levels, all too often the brightness flickers. The Fenix E12 offers digitally regulated output to maintain the brightness levels you select. The E12 is operated via a tail cap switch, both on and off functionality as well as mode selection. The tail cap switch is slightly recessed to prevent users from accidentally powering on the flashlight, but even with the recessed switch the small light is able to securely stand on its tail. The Fenix E12 features a type III hard anodized anti-abrasive finish on an aircraft grade aluminum body to create a durable and reliable flashlight that won’t shatter upon impact. And to protect against improper battery installation the E12 comes with reverse polarity protection. A Light like this would be a great back-up flashlight to always have with you while hunting or anything else. Read our full Fenix E12 Review. The Olight S15 is one of the best AA small LED lights. The Olight S15 uses a top of the line single die CREE XM-L2 LED bulb to light up the darkest corners. The Olight S15 features three different brightness levels, as well as a strobe mode. The multi-function side switch allows users to easily and quickly access the various brightness levels. The S15 also features a memory function that stores the last power setting used. The side switch also provides users with immediate access to the brightest power setting, and engages a lock-out mode to prevent the small light from accidentally turning on. The tail cap on the Olight S15 is flat and comes with a strong magnet, which allows users to stand the small light securely on its end on metal surfaces. The anti-scratch type III hard anodized aircraft-grade aluminum body provides users with a reliable and durable flashlight. The S15 comes with reverse polarity protection to prevent any damage from improper battery installation, as well as thermal management that prevents the small flashlight from overheating. If you are looking for a small LED light, one that is less than 3 inches, you should check out the Olight S10, which unlike the S15 uses a CR123A battery rather than AA. Read our full Olight S15 Review. The Nitecore MT1C is the best small flashlight for a variety of environments, as well as users. The body of the MT1C is made from T6061 T6 aircraft aluminum alloy and then coated with a Type III Military Grade hard anodizing to prevent damage from unexpected impacts. The XP-G R5 LED bulb is protected behind an ultra-clear mineral glass that has been toughened up to resist shattering. 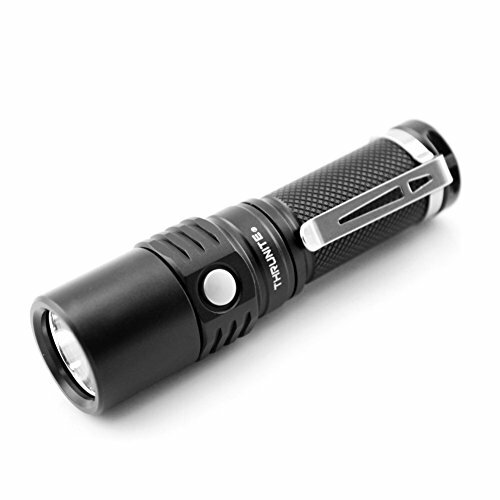 To provide a powerful, smooth beam the Nitecore MT1C features an aluminum reflector. The MT1C comes with an anti-rolling design, as well as a detachable two-way anti-rolling clip, to prevent unwanted falls, plus the rhombic knurling provides users with a more secure grip. The Nitecore MT1C comes with two distinct modes, high and custom. High mode is accessed by tightening the flashlight head, while the custom modes are accessed by loosening the head. The custom modes allow you to customize your brightness level, as well as different functions. To save the current mode simply turn off the MT1C while in the mode you want to save. To ensure a long battery life the MT1C features reverse polarity protection, as well as a high efficiency current circuit board. 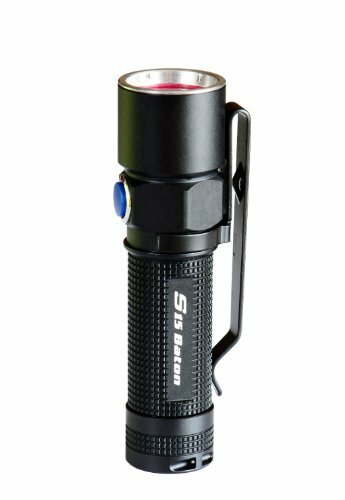 The Sunwayman V11R is an amazing small flashlight that is perfect for those of you that need something to carry around every day. 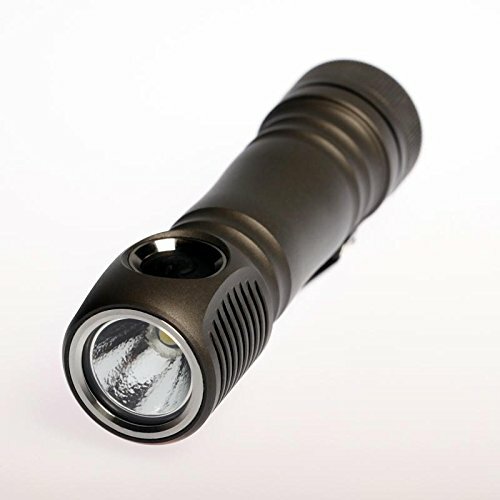 It is also considered the best small tactical flashlight as its OP reflector provides the V11R with a great throw, as well as a perfect beam pattern. One of the biggest concerns users have when they are carrying a flashlight every day is the risk of dropping and breaking the XM-L2 LED light. To help alleviate these concerns the Sunwayman V11R is made from aerospace-grade aluminum alloy, which features a military grade Type III hard anodized body to prevent damage upon impact. The tempered glass lens is built to resist both scratches and impacts. The V11R features two different switch assemblies, which allows you to choose the one you are most comfortable with. The traditional rubber switch is soft to the touch and very simple to use. The other assembly is the Ti switch, which is a tail cap push button that is made of metal, which makes it both practical and durable. Having two switch assembly options always means you have the other around as a backup. This very adaptable light also comes with a small extender tube so it can be used with a AA battery. The Digital Sensor Magnetic Control System pairs up with the Infinite Variable Output Switch to allow users to select between minimum and maximum output levels by simply twisting the rotator ring left to right. If you are looking for the smallest brightest flashlight the Zebralight SC63 is perhaps the best choice around. One of the best things about this small flashlight is its smart user interface, which allows you to quickly and easily access all of the different brightness levels and modes the light has to offer. The Zebralight SC63 provides users with the three main brightness levels, but each of these levels has two sub-levels. Each of the sub-levels can be programmed to provide users with other brightness levels. The Zebralight SC63 offers short click operation for the basic brightness levels, while the accessing the other brightness levels require double clicks from the main level. Beacon-mode, which is also offered, can be accessed by 3 short clicks from the off position. The Cree XHP-35 LED also serves as a battery power indicator, which is activated by 4 rapid, short clicks from the off position. The LED will flash anywhere from 1 to 4 times to indicate how much battery power remains. As the battery power decreases the Zebralight SC63 will automatically step down the brightness levels from high to medium and from medium to low in order to conserve battery life. The Zebralight SC63 comes with built-in over-discharging protection to protect the battery. If the 18650 battery is not your preferred choice, you can check out the Zebralight SC52 that uses AA or the Zebralight SC32 that uses CR123A. If you are looking for the best small flashlight with the best throw the Thrunite Neutron 2A V2 is the perfect choice. To help provide the best throw from the XM-L2 U2 LED bulb the Thrunite Neutron comes with a smooth reflector, which also provides a perfect beam. Powered by 2 AA batteries you never have to worry about not being able to find replacement batteries, as they are easily found just about wherever you go. And to help prevent any damage from occurring due to the batteries being improperly installed the Thrunite Neutron 2A V2 offers reverse polarity protection. This small flashlight offers five different brightness levels, your standard low, medium, and high, but also comes with Turbo and Firefly mode. Your normal brightness levels can be accessed through clicking the operation switch while the flashlight is in normal operation. To access Turbo the flashlight will need to be turned on with a single click from the off position quickly followed by a double click. Firefly is accessed by holding in the switch. To protect the Thrunite Neutron from damage from dropping the aircraft-grade aluminum body offers a Type III hard anodized anti-abrasive finish. The anti-reflective coated lens is an ultra clear tempered glass that is impact resistant. If you are looking for the best small rechargeable flashlight the Olight S15R is an amazing choice. The XM-L2 LED bulb is powered by a Li-Ion 14500 750mAh rechargeable battery. Even better the Olight S15R comes with a micro-USB charging dock so you can easily charge the small light while you are on the go. To help conserve battery life and improve the safety of the flashlight the Olight S15R comes with a thermal management program that automatically lowers the output from high to medium after 15 minutes of constant use. The Olight S15R comes equipped with three basic modes, plus a strobe mode. Each of these modes are easily accessed via the multi-function side switch. In addition to controlling the brightness levels of the Olight S15R the side switch also features a battery power indicator, when the battery begins to run low the switch will begin glowing red. One problem many of us have with using flashlights in the dark is fumbling them before we even turn them on, which makes them almost impossible to find. The Olight S15R comes with a glow in the dark O-ring that is located in the bezel, which makes it very easy to spot. The S15R is made from highly reliable 6061-T6 aluminum alloy that features anti-scratch, Type III hard anodizing coating its stainless steel bezel, which all work together to protect the small light from damage that might incur when dropped. If you are looking for the best small flashlights this article is perfect for pointing you in the right direction. As you can easily see we have reviewed several small LED lights based on what we thought were the best ones. To help narrow down the best small flashlights available for purchase we have separated the small lights based on the type of battery they take, but we have also included the best small light based on throw. Since, so many of us are looking for the best small flashlight for the money, we have included two budget lights for the two most common battery types. Having several different choices of small LED lights allows you, the consumer, to find the one that will work best for you. Just because you are looking at some of the smallest flashlights that doesn’t mean they are not going to offer several different features. 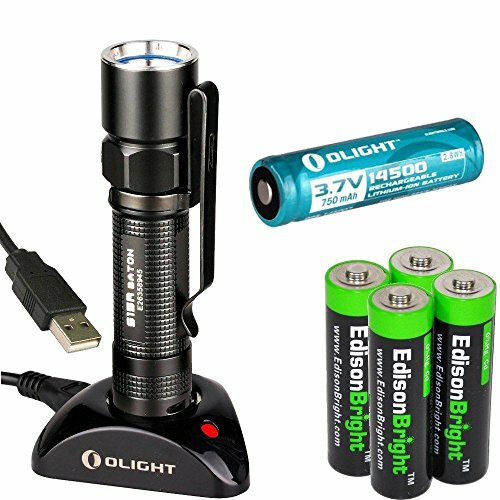 In order for you to find the best small flashlight for your needs you are going to need to review what each light has to offer in terms of features and choose the one that works best for you. Some consumers will find a small pocket flashlight to work best, while others might prefer a small keychain flashlight, so it is always handy. No matter what you might need in terms of small lights the good news is there is something out there for you. We would like to take a quick second to thank you for taking the time out of your busy day to read our “Best Small Flashlight” article. We have many more best flashlight articles that are all specific to certain types of flashlights. If you didn’t find what you were looking for here check out some of our other Best Of articles. Although several of our readers know and understand the vocabulary used in this article, some of our readers might be new to the flashlight world. If you are one of these readers don’t worry, we are here to help make some sense out of the vocabulary used in this article. If you need help with definitions, you can simply take a moment and check out our tactical flashlight’s buyer’s guide. In this guide you will find the best definitions for all of the terms used in this article. Not only can the terms used in the article be confusing, but so can picking out the best small flashlights. To help make the process a bit easier we have included a handy Flashlight Comparison Guide. This guide will allow you to easily compare the top 10 best small flashlights based on certain specifications, including battery type, highest lumens, and so much more. If you are interested in purchasing any of the small flashlights that you read about on this page, please follow one of our links to Amazon where you can easily purchase the small lights.